It’s the 1920s, and Evie O’Neill is being shipped off to New York to live with her Uncle due to bad behavior. And she couldn’t be happier! New York with it’s lights and speakeasies! It’s going to be wonderful! Until she gets drawn into her Uncle’s work investigating occult-based murders, and her own paranormal secret is discovered. . . The secret that could get this killer caught! Add to that plenty of drama, and more supernatural experiences than I could list here and you have The Diviners! 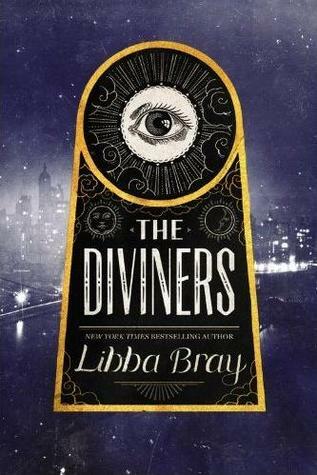 When Libba Bray writes this kind of book, she doesn’t just tell a story, she creates a mythos, and that’s what she’s done with The Diviners. From the first few pages I was drawn in by her beautiful writing, and the spooky vibe. If you’ve read her Gemma Doyle trilogy, and you were disappointed by Beauty Queens and Going Bovine then this was the natural evolution you were looking for in her writing. It’s hard to describe, and even harder to encapsulate this book in such a way that will make you want to read it. Oh, and it’s a LONG read. 578 pages to be exact, but I got through it in about 3 days, so it’s not impossible. And the story moves along at a pretty good speed, so you’re not slogging through the book wishing you were doing something else. But it’s still LONG. If you don’t like that, you won’t like this. If you’re like me, and don’t care, then this won’t bother you. Read this! Read it now! If you only read one book this year, make it this one! It is a good, spooky read, with everything you could want. The characters are special and memorable, and definitely not perfect, which makes them all the more human. I loved it, and I can’t wait to read the next book! Ahhh! I’m A Week Behind!